I have come to the realization that I need to grow in my understanding of what, exactly, the gospel of Christ is. I, like I'm sure most of you, can give a quick answer for what the gospel is, but do I really know it? Do I really believe it? Do I really understand it and make it a part of my life? Not usually. So I've added gospel pages to my Bible journal and add to them any time I come across statements of truth in the Bible. And as I'm reading more and more works by Puritan pastors and theologians, I realize how incomplete and uninformed my understanding of the whole of gospel truly is. On six blank pages in my Bible journal I've written a title on each page. On this page, list any truths you find in scripture of your state before you accepted God's gift of salvation and grace. Seek out truths to know the Holy Spirit and the role He plays in our lives better. Now, anytime I am reading anywhere in the Bible (or other good, solid books) I write down notes on the appropriate page. A great place in the Bible to start is in Ephesians chapter 2. It's laid out pretty plainly. Add in any truths you find in any of the epistles, and dig out the truths sprinkled through the gospels and the Old Testament. As you fill a page, at the bottom of the page, write "continued on page __" and flip to the next blank page, title it the same, and continue filling the information. And every day, as you are spending time with God, flip through those pages. Soak in the truths. Make them into a prayer of repentance, thankfulness, and hope. How well versed are you in the gospel truths? Share your thoughts below and let's get this important conversation going! Wonderful article! Thank you so much for your God-inspired wisdom. I am right there with you in your thinking and will be putting your ideas into practice. I need all the help I can get! You and me both! I pray it blesses all of us and grows us closer to Him! Wow! I thought I knew what the gospel is- the good news of Christ and more simplistic truth but there is so much more..., mature true to the gospel that I never thought to put into practice. Thanks Kari for making me accountable to growing deeper in Christ. I just made my Gospel pages! It has lifted my dull heart with renewed joy! Thanks for doing this Kari! So needed! Thank you for allowing God to use you. I am a minister and have grown complacent. I appreciate this information and inspiration! God bless you! complacency is KILLING me! Glad to know it's not only me! Thank you for this timely email. I've been slacking in my bible study. I don't seem to sleep well anymore as something always seems to wake me up so I'm tired all the time. I find I can use it as almost an excuse not to get into my Bible. If my kids are still asleep I could be getting into my Bible but sometimes I just go back to sleep. Then once the kids are up, it's a never ending stream of things to be done. Yes! Love it! Think of what a blessing it will be to go back through pages and pages of this truth! Great start! 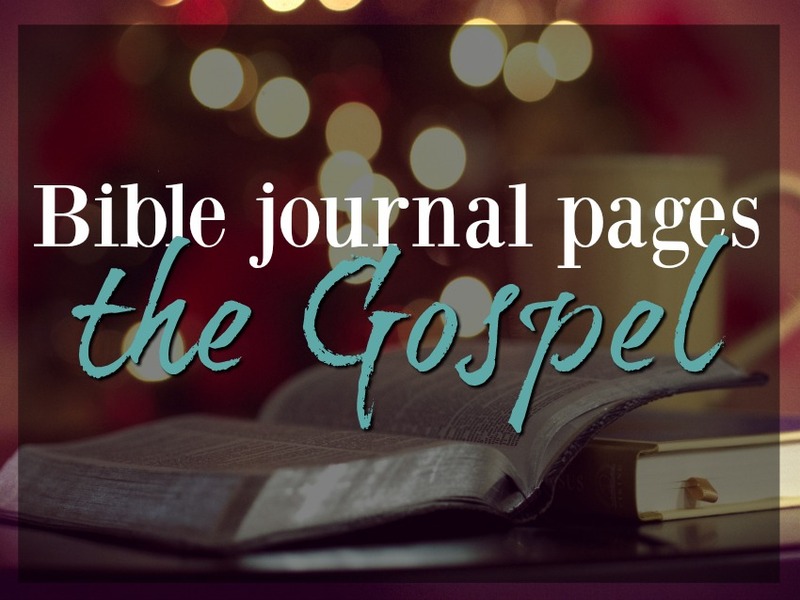 This Bible journal suggestion lends itself to continuous use as one journeys through the Word. For me, many do not. Thanks. Yes! I think we could go on for years and never reach the end of it! Wow, Kari. This is such a great idea. Not only is it good to boost my time with the Lord, but it is good to use in counseling others biblically. Thank you for sharing this.....Linda E.
Thanks Kari. The Gospel seems to me to begin right at the beginning of creation when God created man to be in His image and likeness - to be His representative on earth and have dominion over it all. Man was meant to bring glory to God, and all of His creation does when it performs the purpose for which it was created. But we were given a choice, and the desire to do what is right in our own eyes always seems to thwart the idea of being in the image and likeness of God. The Gospel seems to be God extending the opportunity to everyone to change this by having faith in His provision of His Son, who conquered the flesh and submitted his will to God. This seems to be the challenge of the Gospel - to conquer the flesh and submit to the will of God.